There's nothing like killing two birds with one stone, and in his The Complete Guide to the Drinks of James Bond, author David Leigh does just that - writing a book that focuses on two subjects clearly close to his heart: the world of alcoholic beverages and, yes, the world of James Bond. As any fan of 007 knows (and, don't doubt it, this is definitely a publication for fans), drinking and Bond have always converged, both in the literary and the cinematic ventures of the world's most conspicuous secret agent. And, comprehensively, it's on both these Bondian media that Leigh devotes his drink-related focus and research. Split into logical sections (Spirits and Aperitifs; Cocktails; Wine; Beer), Leigh guides us through the disparate drinks to have appeared in the novels, short stories and films. Some of them exclusive (the Old Fashioned cocktail - favourite of Mad Men's Don Draper); others surprising (Gin and Tonic - when on Earth did Bond drink a G &T? In Goldfinger the novel apparently); others deadly (the Black Velvet cocktail - half-a-pint of Guinness and half-a-pint of Champagne!) 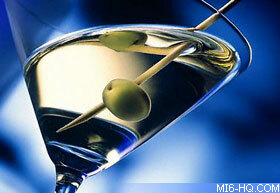 and others now sadly unobtainable (the Vesper cocktail - it's all the Kina Lillet's fault). Right: Cover art for the new edition of the "Drinks of James Bond". However, what makes this book such an enjoyable one to dip into is the author's attention to detail. Not necessarily detail from the world of Bond (no 007 fan worth their salt would be tripped up by Leigh's references), but by the detail he goes into in terms of the drinks world. Wonderful tidbits are littered throughout. Such as short, handy potted-histories of the likes of whisk(e)y and vodka, the facts that Japanese spirit shochu overtook sake's sales in its homeland a few years back and that Champagne supremo Pierre Taittinger was a Nazi sympathiser who switched sides to the Resistance. Fascinating stuff, all of it. The book also contains a 'Q Section', in which the author fills in readers on drinks culture accoutrements (tumblers; ice buckets; high ball glasses; brandy balloons and the like). Here we have useful descriptions of what each are and also advice borne out of experience - always buy a decent corkscrew... or use one that comes with the ever resourceful Swiss Army Knife. 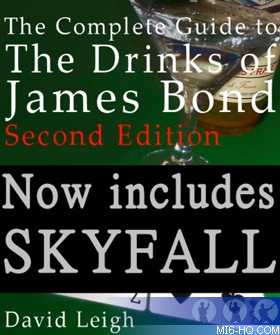 Also, as this is the Second Edition of this publication (the first was published in 2010), it smartly contains details on the drinks featured in last year's Skyfall, covering too then the media-fixated hoopla over the inclusion of Heineken beer in the movie - Leigh skilfully delivers a fine apolologia on this subject. Overall then, this is a comprehensive, well researched, yet slim and accessible companion for anyone reading a Fleming book or watching an Eon flick who suddenly realises they'd like to know a little more about a particular beverage their hero's whetting his palette with. And, while you may say it's more drink-detail-heavy than Bond-detail-heavy, don't doubt its 007 credentials; any book that explains what 'bon-bois' is (as mentioned to flummoxing effect in the brandy scene from Goldfinger the film) surely belongs on the book shelf - or in the drinks cabinet - of a true Bond fan.